Not only is today World Autism Awareness Day, but April is National Autism Awareness Month and it feels very different to me this year. This year, we know that our son has Asperger’s Syndrome. For many years, I suspected that my son was on the spectrum. Almost a year ago, we found the one medical professional that really got to the bottom of everything that was going on. She listened, watched, observed at school, and tested our kiddo. She knew that this was a topic that upset me. You see, for many years we had people say yes and no over and over again. It wasn’t necessarily that the diagnosis of autism bothered me, it was the how. As an educator I am told not to judge people too quickly. Yet, several times, so-called professionals would meet my child and diagnose him within ten minutes. They didn’t talk, play, or interact with him during that time. They were talking with me and made the call on nothing else. This year, I am an autism advocate and warrior. I am on a mission to make my son’s life better and to help others to understand him. He may be an Aspie, but it is not who he is. Thanks to an amazing autism community in the Capital Region and beyond we have found resources that have been beyond helpful, met fantastic friends, and educated ourselves and others. The truth is we know NHL best and we are the ones that are going to battle to get him what he needs to be as successful as he can. His autism diagnosis has not been a bad thing, it helped us to finally have answers. It has allowed us to better understand our son and also TechyDad. You see NHL’s diagnosis actually opened his eyes to what he had been living and dealing with his entire life. Yes, the geek that I fell in love with and married almost 12 years ago is also an Aspie. It explains a lot and has helped our family. TechyDad has been able to explain to NHL things that he has done in his life to learn how to relate in certain stressful social situations. My biggest wish for all those living with Autism in their lives is to find acceptance. Too many people judge, point fingers, and blame. Rather than do this, talk to families and friends you may know who have members on the spectrum and get educated. Do not look at the media for answers because they often sensationalize too much and are not always honest about things. If you find yourself with an autism diagnosis for your child, it can be overwhelming. I had time as we sought answers to learn to accept things. Still, it was hard to know where to turn first. My advice is to quickly look for support groups in your area. Find other parents and families that you can work with and who can help you learn the system. Knowledge is power and so is being part of a very supportive community. If you take one other thing away from this post please remember that autism is a neurological and not psychological. People with autism are wired differently, not worse. Posts about autism written by TechyDad can be found here including Asperger’s Syndrome Resources. I have linked to some of my previous posts about autism above, but others can be located here. Disclosure: The World Autism Awareness Day logo came from Autism Speaks and other materials can be found on their website. 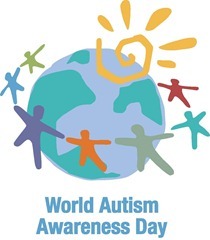 The Autism Awareness ribbon icon above was created by Melesse and comes from Wikimedia Commons. No one advocates better than a parent, your son has a great advocate in his corner! As far as Techy Dad, whatever skills he learned to cope throughout his life, there are many folks not on any spectrum that could learn a lot from him, he was one of the more sociable and intelligent people I had the chance to chat with in December! Mitch´s last blog post ..Giveaway – $25 Children’s Place Gift Card!